Today we're not only co-hosting our weekly FitDog Friday Blog Hop, we're also participating in the annual Dog Agility Blog Action Day. 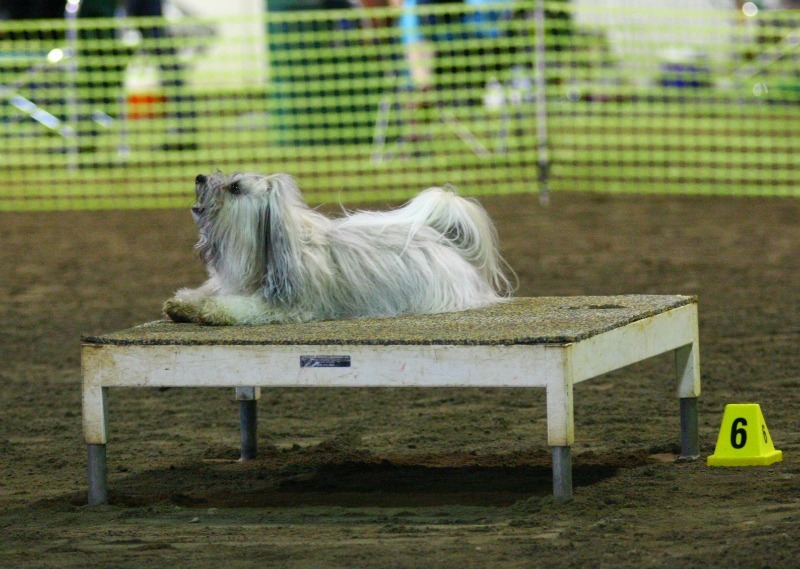 This year's agility blog action day topic is "FUN!". Seems like it should be an easy topic to discuss, right? Who doesn't love to have some fun?! But in agility, as in everything in life, sometimes we lose our way to fun. Things get in the way. We get in our own way. We put pressure on ourselves to do everything exactly “right”. But agility -- just like life -- is not a game of perfect. 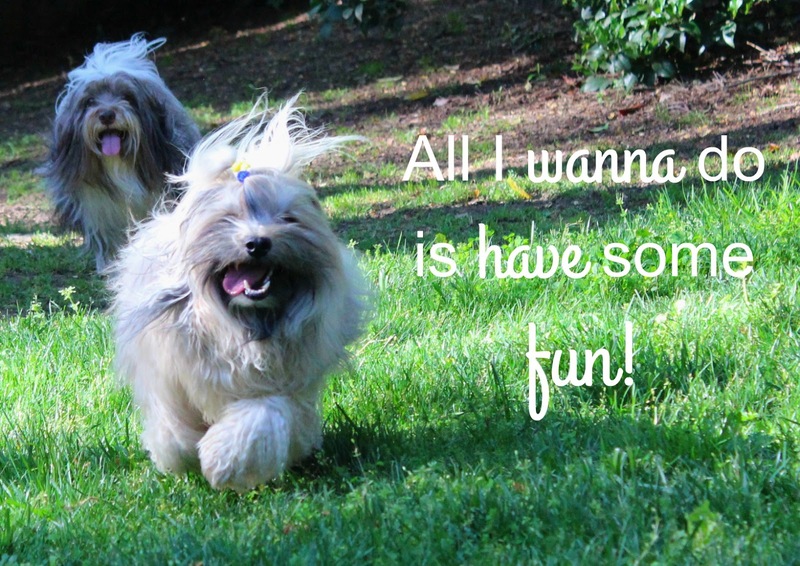 My 3-year-old Havanese Rocco reminds me that everything doesn't have to be perfect in order to have some fun. Qs and ribbons aren't the only way to have fun. We can find the fun along the way. For us, fun is learning. Fun is enjoying every little challenge along the way. And sometimes, fun is simply playing with our pals. No matter what your sport or whatever in life you're trying to achieve, it sure is a lot more enjoyable if you're having fun. Rocco hasn't always had fun doing agility. We went through a period where he didn't want to run at trials. Too much pressure? Maybe. Not enough fun? Probably. So we set out to make everything about training, and life, fun. It's fun to do tricks, play games and to get all revved up before playing chase. It's even fun waiting on the table! Anticipation can be fun! Sports psychologists say to be confident, think positive thoughts, believe in yourself and... have fun. Rocco says don't take yourself too seriously, laugh, be pawsitive and treat yourself often! I say love yourself, love your dog and remember to smile before you enter the ring, or before doing just about anything. Tell yourself, "this is going to be fun!" Be positive, and pawsitive, and the good will come back to you. It may not always be perfect, but you'll have a good time along the way and be in a great state of mind for conquering challenges and anything else that comes your way. What do you do to find the way to fun? Fun is the key to success in dog sports. We learned that last fall when things weren't going so well. Mom added in fun, good rewards, and all of the sudden, we were doing well again. Awesome! Pretty cool that remembering to have fun can make such a big difference! Great post! 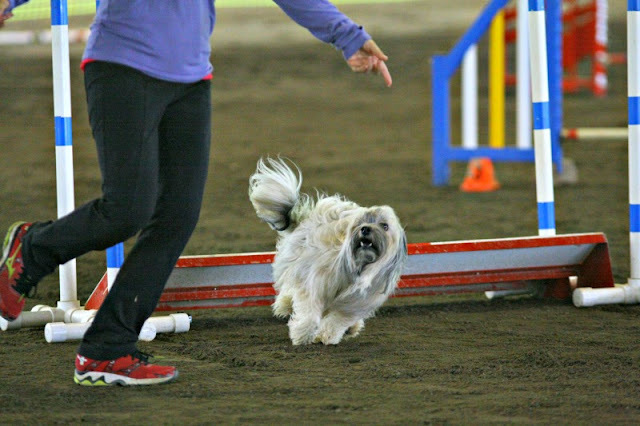 It can be easy to forget about the fun when training, especially with agility. Early on in our training, our first trainer told me, "In agility, you'll fail more times than you'll succeed" and that really helped me remember to keep the fun in mind (at least most of the time--and when I forget, Barley's there to remind me!). So true! 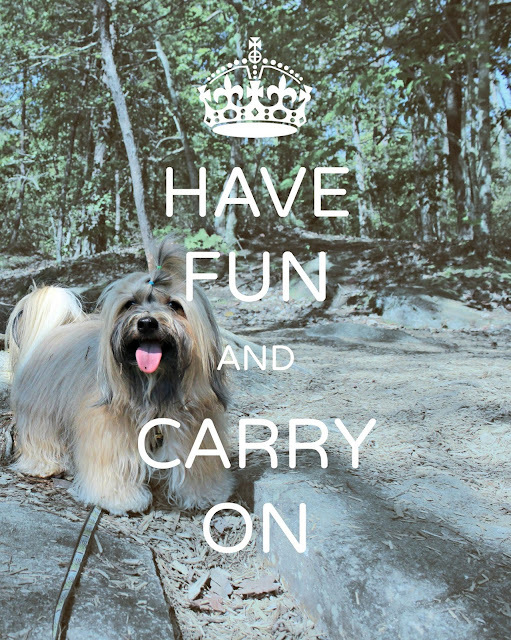 Dogs are good about reminding us to have fun! Rocco's all about the fun! I let Mr. N pick his sports. After all, if he isn't enjoying himself why bother? He thought Barn Hunt was a tease. All that finding and no getting to "play" with the rats? Good point! You've got to enjoy the sport you're playing. We'll likely try some lure coursing too. I think Rocco will love it! Rocco always looks as if he is having a great time! Rocco LOVES to have a good time! Amen to those very wise words!! I used to strive for perfection all the time which caused more frustration than anything else. Ever since making the conscientious effort of approaching things with a more relaxed state of mind, I've been having a lot more fun with everything I do! Thanks for the "fun' reminder, Diane and Rocco. It seems that most of you humans need to be reminded to have fun...so just look over at your pooch and head out the door! I know... the pups always know how to have fun! Never done agility with my dog and I don't intend to at her age, but truer words have never been said! It's all about having fun with our furry friends. Mouths open, tongues out, tails wagging!